I don’t know what it is about the Prius. Every time I pass one on the road, there’s something about the styling, the holier-than-thou mission statement and the way that they’re often being driven that just makes it tough for me to like them. I determined it was time to find out if they’re as awful as I tell myself they are. 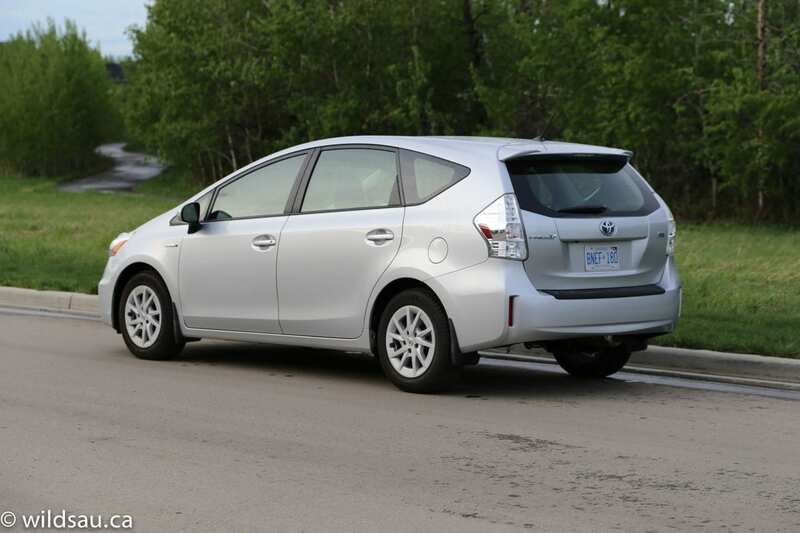 From the outside, the Prius V comes across as noticeably bigger than the standard Prius. I’m a wagon nerd, so vehicles like this make me smile. I like the overall shape, and feel that it’s quite an improvement on the normal Prius’ hunchback style. 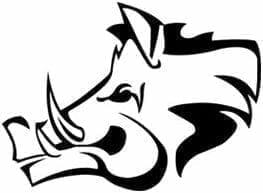 The lines are clean, smooth and purposeful. Its proportions stretched to make room where it matters inside, it has evolved into something ever-so-slightly less ugly-duckling and more wagon-like. If you take a close look, much effort has been made to make this a slippery eel in the wind. 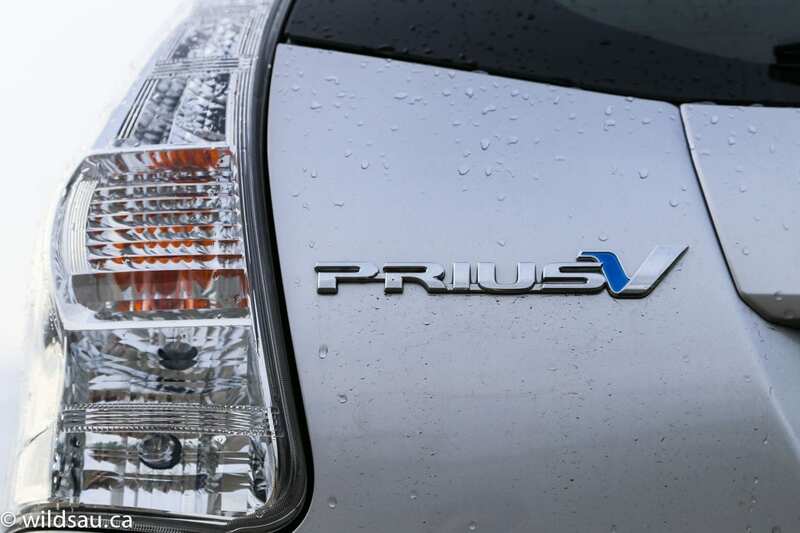 Little touches everywhere show how significant aerodynamics are in the Prius equation. The 16-inch rims with wheel covers look pretty cheap. 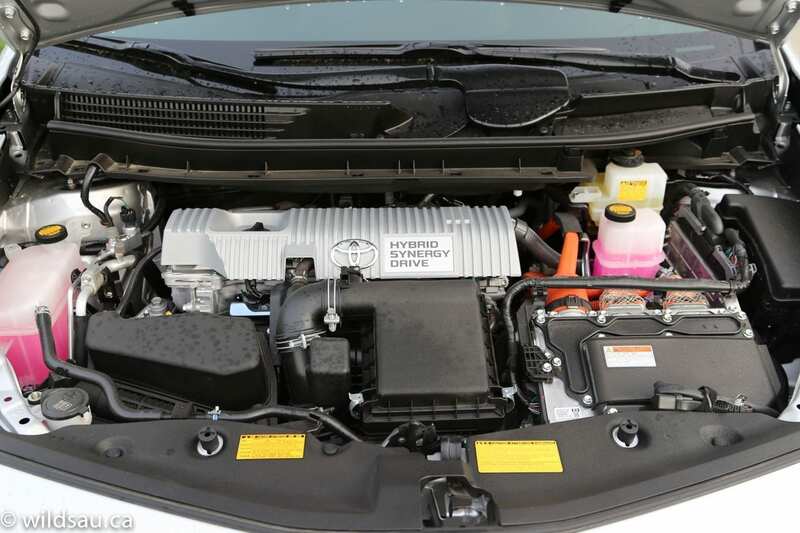 Under the hood sits the familiar 1.8-Litre 4-cylinder gas engine mated to Toyota’s hybrid drivetrain. It puts out a net 134 HP – the same as the regular Prius. The car isn’t light at 3274 pounds, but considering its size and utility and that there’s a big battery pack, I think that’s reasonable. The magic happens when it comes to fuel consumption. It’s rated at 4.3 L/100 km (55 US mpg) in the city and 4.8 L/100 km (49 US mpg) on the highway. I ended up with an average of 5.1 L/100 km (46 US mpg) with absolutely no effort to save fuel. Yes, it has a smallish 45 litre tank, but with numbers like these, even that little tank lets you go for a couple of weeks at minimum. The Prius’ interior must have been inspired by the “50 Shades of Grey” book. But not in a spicy way. It’s rather drab and has a strange mix of materials. There’s padded, soft-touch and hard plastics, and a variety of unique textures and patterns going on. 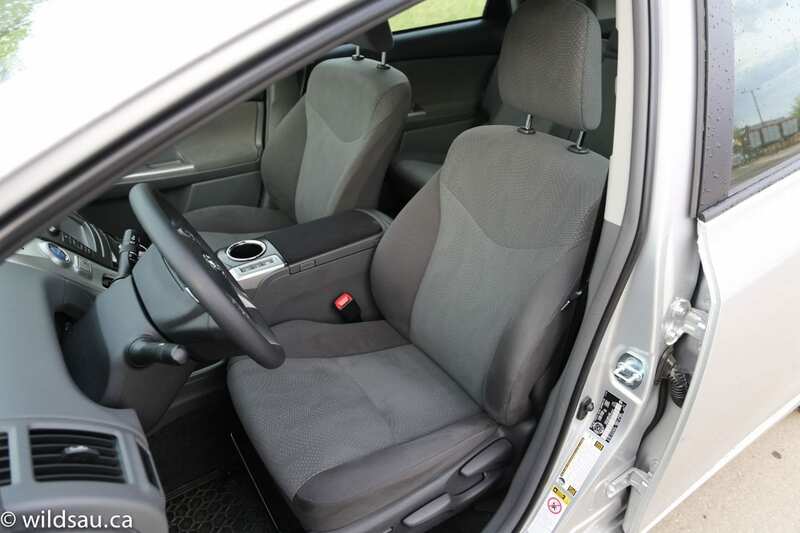 With that said, the interior is very roomy, comfortable and ultimately, highly functional. The manually-adjustable fabric seats were pretty comfortable and reasonably well-bolstered for a car like this. I found the headroom to be great (I’m 5’10”), and the foot wells are spacious. Behind the steering wheel is a very deep dash, stretching off into the distance thanks to that raked-back windshield. There is nary a physical gauge to be found. All your information is in the wide, hooded display bin in the center of the dash. I’m not a fan of center-mounted instrumentation and this one is very busy. Not an easy way to glean information quickly, that’s for sure. 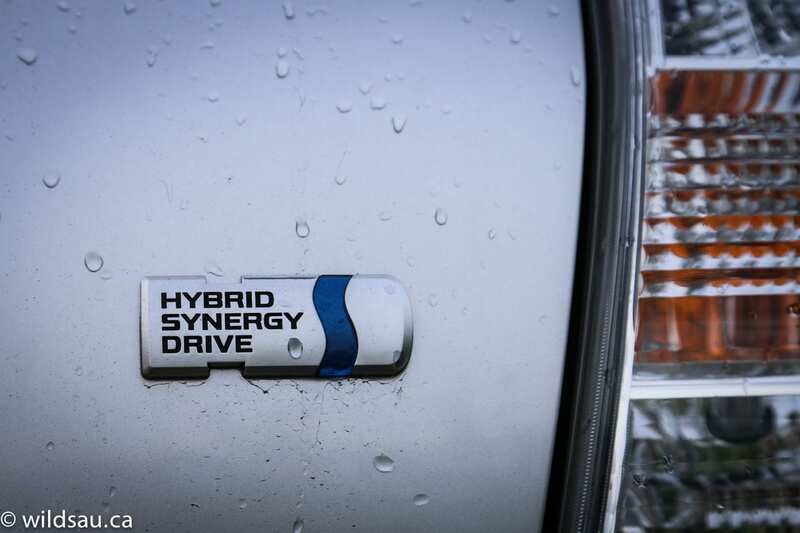 Instead of a center stack, the Prius gets a big chin – it reminds me of Lord Farquaad from Shrek. 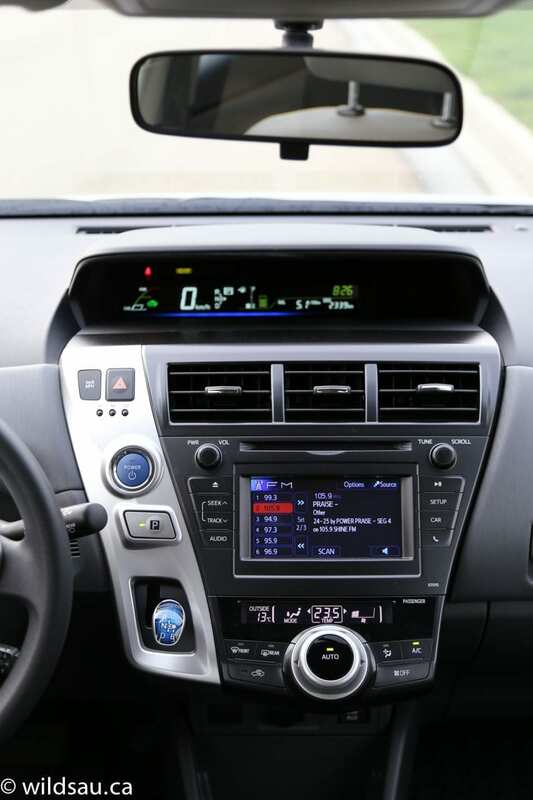 Here you’ll find a 6.1″ touchscreen media system, an automatic climate control system and of course the combination of a push-start ignition, the Prius joystick shifter and a “Park” button. A goofy set-up to be sure. There is no real driver assistance tech at the base level, short of the backup camera. 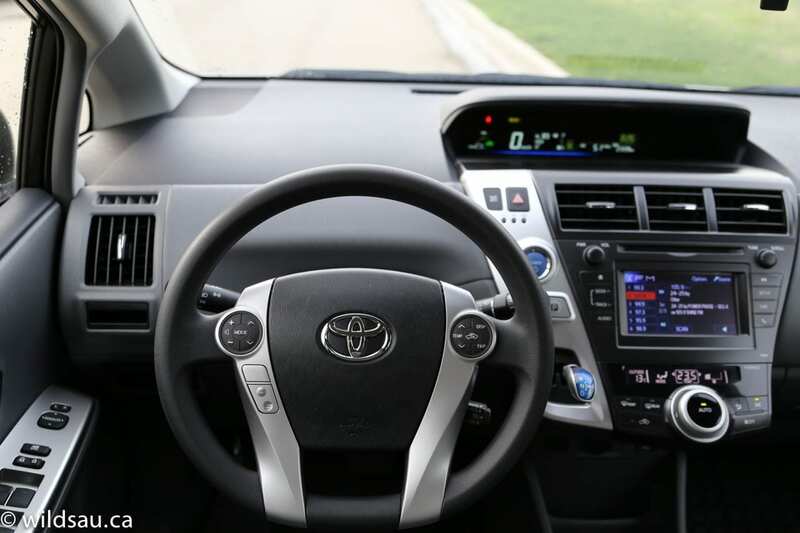 Speaking of missing “tech”, Toyota still hasn’t given the Prius the ability to blink the signal light three times when you tap the stalk. Way to go, Toyota. We loved the plethora of storage options throughout the cabin. Two glove compartments (over and under), a deep storage well under the arm rest lid, and a vast open drop-in bin in the centre make it easy to find a resting place for your stuff. Speaking of the armrest lid, it’s upholstered (strangely) in a black fabric that doesn’t match anything else in the car. I’m guessing that fabric won’t stay nice and clean for long. Unfortunately there’s only a single centre cupholder, so the passenger needs to use a strange pop-out one on the right side of the dash. 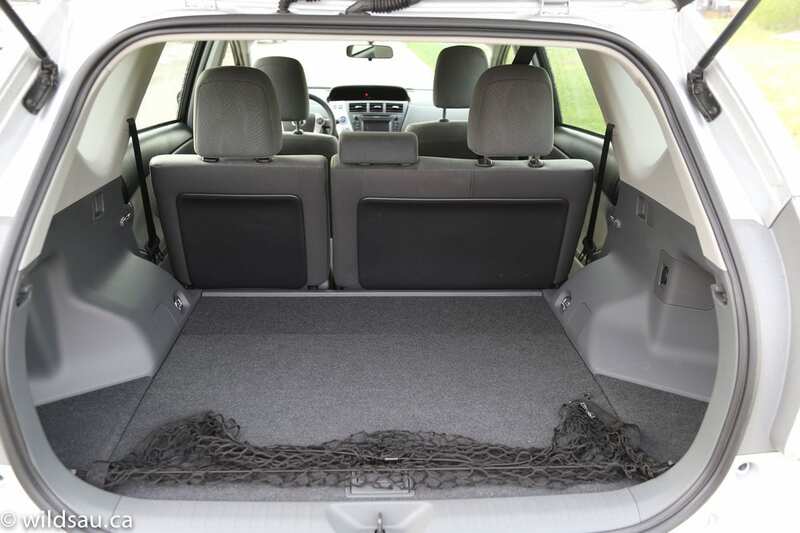 The Prius V’s trunk is large and easily accessible. The load floor is relatively high (since the battery is under there. 971 litres of cargo volume greet you – that’s a lot to begin with. Slide the rear seats forward and that grows to 1138 Liters – doing this creates a neat vertical space behind those rear seats, where you can put smaller bags, etc – very hand for road trips. Fold the rear seats down (they split 60/40) and you’ll find yourself with an massive SUV-like 1905 litre trunk. The rear seating area was a very pleasant surprise. There are 3 seats, each with a seat belt and headrest. 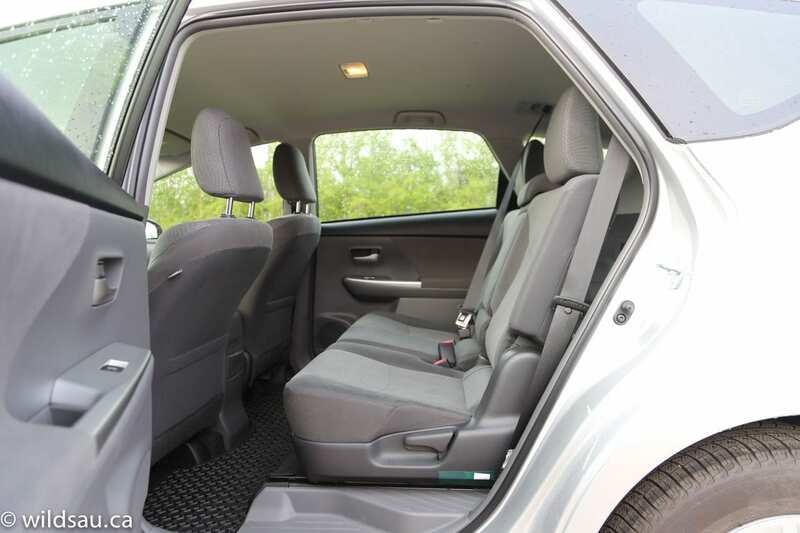 The Prius V offers a significant amount of space back there, affording you plenty of comfort, along with head-, leg- and foot room in the back, especially for the two outboard seating positions. In addition, the seats slide fore and aft and recline, adding further flexibility and the flat floor helps too. A third adult will feel a little cramped in the middle position but our three kids had more than enough space back there. There are two LATCH anchors for kids’ seats. 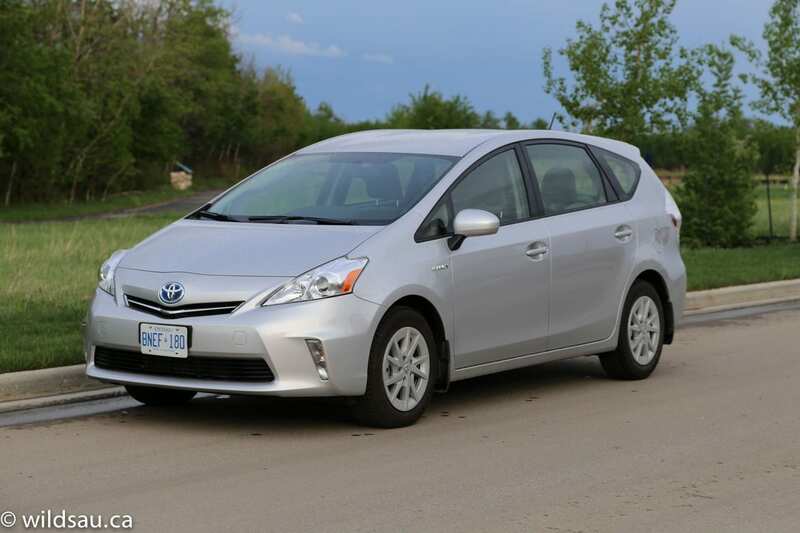 I hate to admit it, but the Prius V is a decent car for every day driving. It’s not fast, of course, or fun, but you don’t buy this car to drive fast. 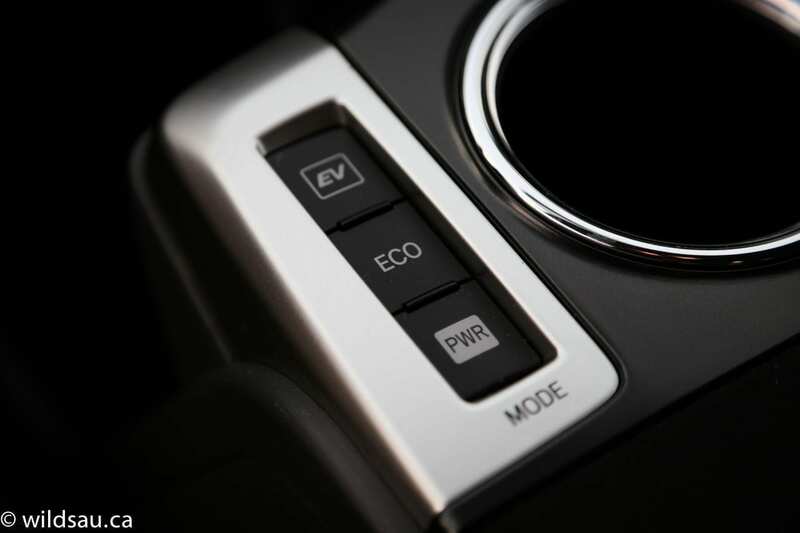 In ECO mode, there’s enough power to keep up with traffic, and if you put it in PWR mode, it’ll actually feel more sprightly than you might expect – all things considered. 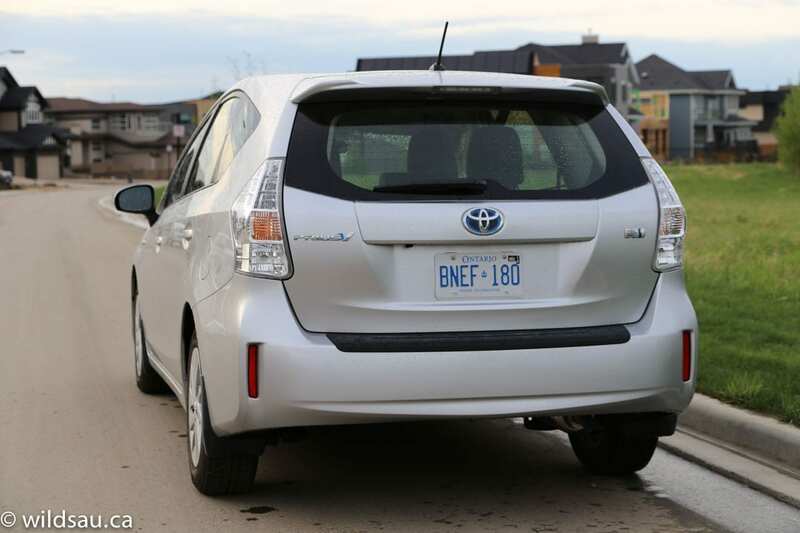 Off the line, if you take it easy, the Prius often stays on electric power, saving a ton of fuel. Step on it and the CVT sends RPMs soaring, holding them steady as the car finds its pace, and the gas engine does get buzzy at higher RPMs. The ride is good – it’s firm but compliant and it obviously favors comfort over sportiness. Handling, while coming with quite a bit of body roll, is surprisingly predictable and competent. 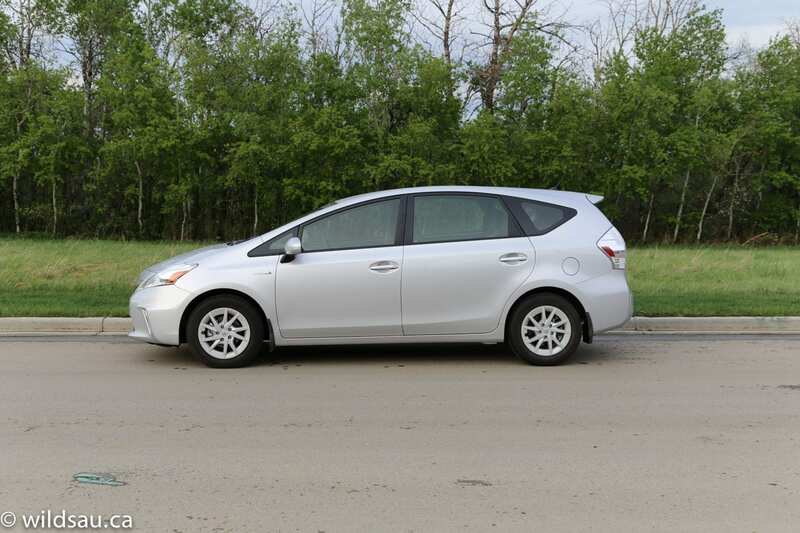 The Prius V’s ability to pass on the highway is limited and takes some planning. With that said, it cruises very comfortably at high speeds – it’s quiet and the ride is smooth. Overall, this is a pretty quiet car – I did notice some intrusive road noise on occasion and I’m guessing the low rolling resistance tires might be the culprits. 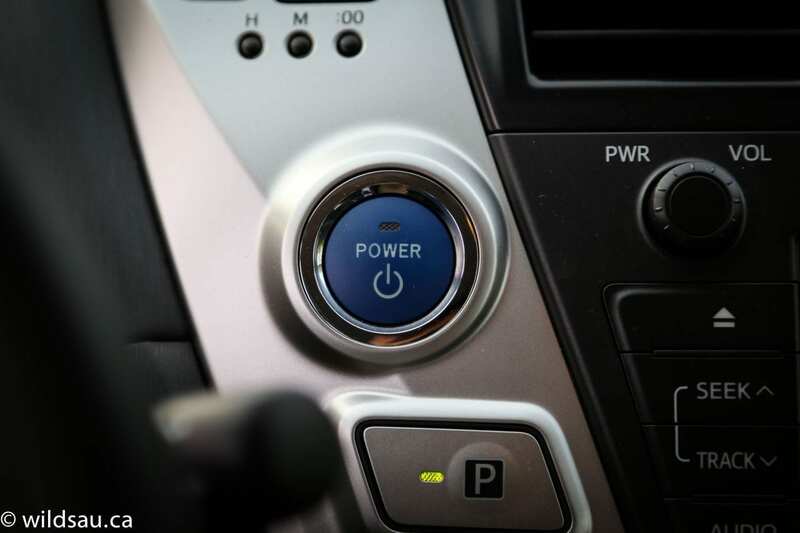 The brakes use braking energy to regenerate power, are mushy and have a strange resistance to them – typical for a hybrid and something you get used to rather quickly. Outward visibility is great, except shoulder checking. Those rear haunches angle up and get in the way. No longer just the choice of tree-hugging, Mother Earth loving folk, the Prius has long busted out of its niche and has become a popular choice for many. I don’t think Toyota ever set out to satisfy a niche, but rather hoped the Prius would become the choice for a new generation of car buyers. The choice for those willing to make a few sacrifices in order to achieve what they felt was important, whether that’s saving money at the pump or making a difference in the world. I’m here to tell you the Prius, especially in this V configuration, offers up an intelligent choice. The vehicle very clearly succeeds in its role. It’s certainly not a sporty, fun-to-drive car, but in the end, it never sells itself as one. It delivers on everything it promises. A smart choice to get from point A to point B in efficient comfort. Also, it has very little competition out there. Perhaps only the Ford C-Max comes close. WAF (Wife Acceptance Factor) was surprisingly high. She really liked it. She loved the space for shopping and she said it was easy to drive, though she didn’t like the weird gear selector/park button combination. We are a family of 5, and this car works for us. We fit in it, we were able to transport an amazing amount of stuff (while still all being in the car), we were comfortable and we were barely sipping fuel out of the tank while doing all this. Top all this off with a reasonable price and proven reliability. 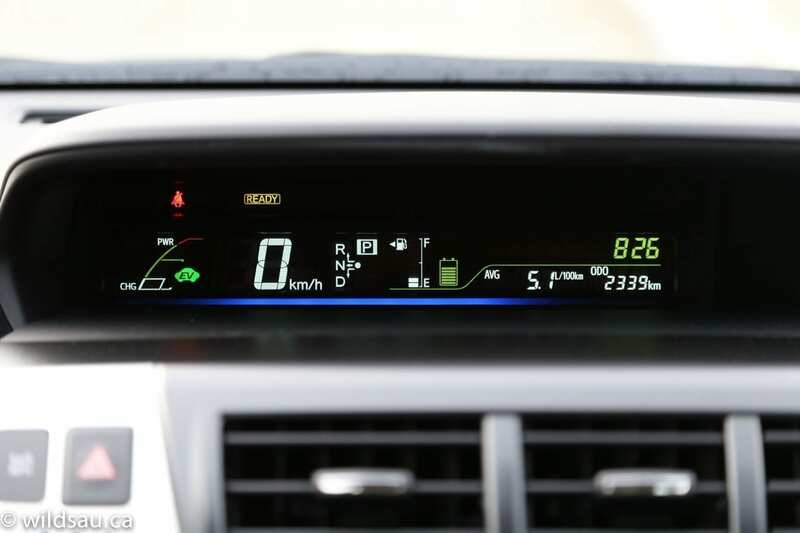 If these are checkboxes on your shopping list, the Prius V is a solid choice. Yes, it’s boring as all get out, but it does everything else well. Which I believe is exactly what it set out to do.